Though remodelled between 1876 and 1896, the basic walling is still that of the Chapel Royal of 1793. The future Prince Regent laid the foundation stone, but seldom worshipped there (according to legend he took exception to a sermon he heard there (Mitchell/Shell Guide p86)) and it was initially only used during the summer season. In 1803 it became a chapel of ease to St Nicholas (Sawyer I p299). When built, the chapel stood behind a house on North Street. It was a stuccoed box with galleries, a lantern and a low south colonnade. Nothing beyond his name is known for certain about the architect, T Saunders (1 p4). Beyond the removal of the lantern in 1807 and its re-instatement in 1848 (Sawyer I p305), little was changed until 1876, when Sir A W Blomfield recast the interior (B 34 p498). He was constrained by the need to keep the existing structure; the coved ceiling rising to the lantern can have changed little. The altar remained at the west end in a new short recess, with galleries on three sides. Blomfield gave these new fronts in dark wood, with iron columns and fretted arches above and there is a similar arrangement in front of the sanctuary. The Royal pew on the east side previously had a bowed front, but this became straight (Sawyer I p309). External changes started in 1879, when Blomfield (ESRO Par 259/4/1/1) designed an east front with a double belfry on the gable. 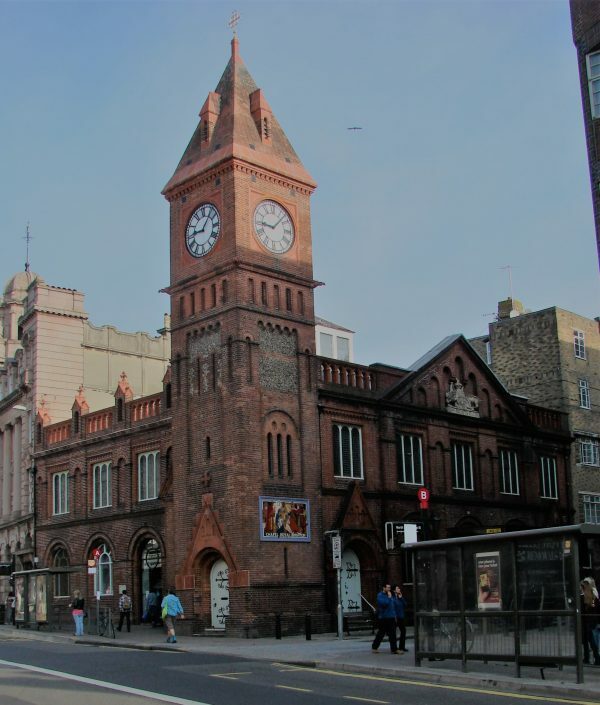 However, shortly afterwards, in 1882, North Street was widened, thereby revealing the south side for the first time, so this was the first part of the outside to be transformed to his design in brick and terra cotta. The form was determined by the interior, with two tiers of windows, the lower with rounded heads and the upper square-headed. Above is a heavy arcaded parapet with pinnacles. Blomfield’s south east tower (VCH 7 p261) is also the entrance. The brickwork is relieved by flint panels, with a large clock under a four-sided brick spire. Before it became parochial in 1896 (1 p27), the chapel must have been a curious sight, for it still had the east front of 1793. Blomfield’s design of 1879 was then carried out, so that it matched the south front. 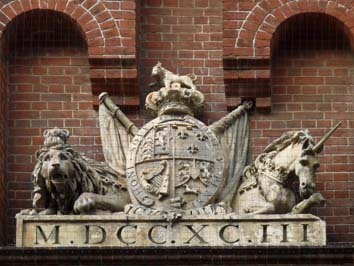 The Royal Arms dated 1793 are by E Coade and are in her artificial stone (A Kelly p184); if examined closely they have, unusually, a three-stop label along the top, thus indicating that they are they not the Arms of the then king, George III, but of his son. They were originally on the south colonnade, but were placed by Blomfield in the triangular pediment, where they are flanked by dwarf arcading. The overall effect of the whole building is quite un-Anglican. The obituary of R S Hyde (Arch J 38 p344) states that he and E E Scott also did work on the chapel, but no more is known. As they were together in the 1870s, it is possible that they were involved in preparations for the widening of North Street. 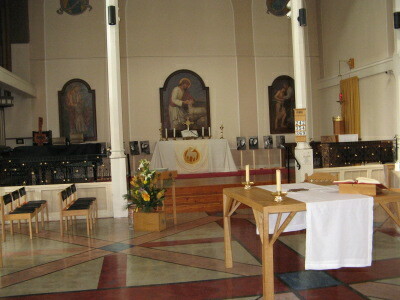 For the chapel to remain viable, the space under the south gallery was converted into a religious bookshop in the 1970s. Despite this, the resident population of the parish became so small that in 1978 it was made part of the parish of St Nicholas. In c1992 the bookshop moved out (1 p26) and in honour of the bicentenary of the first building Caroe and Partners (Cocke p87) re-ordered the chapel round a central table and it was redecorated in light colours. 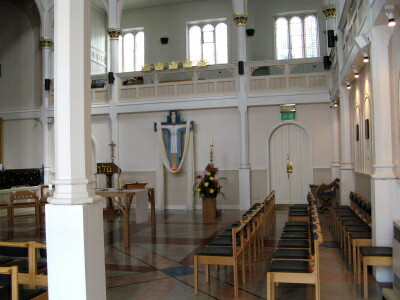 It continues in use and the space under the north gallery has been partitioned off, whilst the former altar area is little used except for purposes of music. In 2012 the exterior was restored, which included the conservation of the terra cotta work. The architects were HMDW Architects, supervising architect J Vallis (The Times 24 Nov 2012) and the project won the King of Prussia’s gold medal for that year, awarded by the ICBS. Altar rails: Good late C19 ironwork. 1. (North wall, westernmost window) H R Mileham, 1947 (WSRO Fac 245). 2. (North wall, centre) W James and Co, 1907 (www.stainedglassrecords.org retrieved on 4/2/2013). Glass inner doors: Recently (2012) installed with engraved glass including the arms of George III. 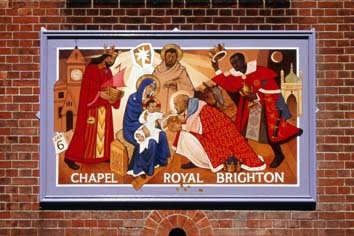 Reredos: Three paintings of 1926-27 by H R Mileham (2 p33) from this are now in the western recess. 2. (Interior – east gallery front). Also dated 1793 and marking the original royal pew. 3. (Interior – cafe area) Carved arms of Queen Victoria (or later) (noted by Nick Wiseman). Sign: (On tower exterior) J Armstrong, 1999 (CT 10 Dec 1999). Table: Designed by P Letschka, 2006 (1 p27). Wall decoration: (Sanctuary) Despite the muted colours, this is part of the work by Heaton, Butler and Bayne of 1876 (Sawyer I p309), which had to be repainted within four years (3 p22). 1. Josie Campbell for making the two photographs of the interior available. 2. Nick Wiseman, who took those of the exterior Royal Arms and the church sign, as well as pointing out the heraldic significance of the former.